My goodness, a whole lot just happened in tonight’s episode! (Enough to justify sending Arrow off on a four-week hiatus, apparently, which I am not at all thrilled about.) There’s plenty of potential fallout from this episode that we’re likely going to need to see the follow-up before we can really judge. Has Damien Darhk really been depowered? Has Oliver really dropped out of the mayoral race for good, ceding control of Star City to, if not the most diabolical mass-murderer to occupy that office, then certainly a solid contender for the top three? Has Felicity really regained the ability to walk for good, and has she really walked out on Oliver? I’m sure some of those answers can already be worked out by looking at flash-forwards and trailers and episode synopses, but for those restricting their viewing to just the show itself, tonight leaves us with a bunch of questions for which there are no immediate answers. But first: Vixen! 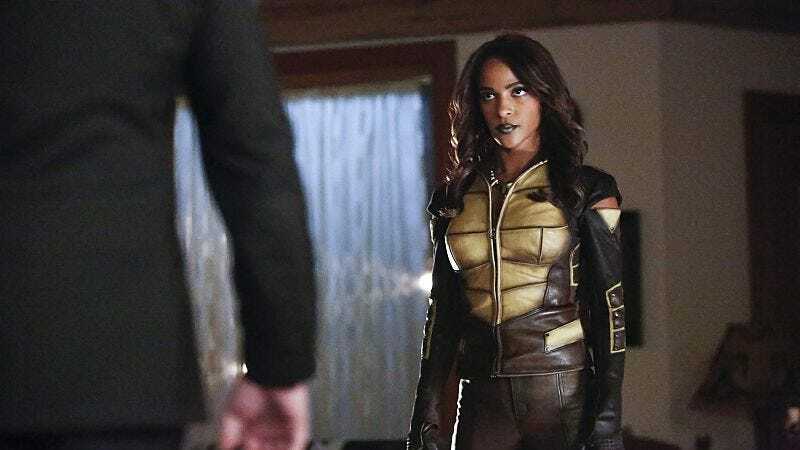 Megalyn Echikunwoke makes her live-action debut as Detroit’s own Mari McCabe after appearing last year in the CW Seed’s cartoon shorts—explaining why Oliver described their adventure last year as “animated,” for reasons that I’m sure made perfect sense in-universe. Considering Echikunwoke was originally cast for her voice-acting chops, and considering Vixen’s totem-based animal powers feel particularly well-suited to animation, there was no guarantee going into tonight’s episode that the character or the performance would translate to Arrow. But, give or take Mari racing past Damien Darhk to grab his totem, the special effects look damn good here, easily up to the same quality as those viewers have come to expect for other superpowered heroes like Flash or Firestorm. And Echikunwoke makes a damn near seamless transition to live-action (though I would submit the yellow of Vixen’s outfit could maybe do with a tweak to something a little less, well, mustard). Even though Echikunwoke’s previous work as Vixen consists of what is essentially a single 30-minute animated origin story, she projects the same kind of superhero star quality that Stephen Amell and Grant Gustin (and Matt Ryan as Constantine, for that matter) have when guesting on each other’s shows. Some of that is down to the writing, which respects Vixen enough to give her a distinct perspective on tonight’s emotional conflict and the critical role in defeating Darhk. I still have plenty of issues with the whole William storyline—and, yeah, sorry everyone, I’m probably going to do a bit more kvetching on that topic in a paragraph or two—but it’s a very nice move to have Mari compare her own upbringing with her foster parents to William’s separation from Oliver. The temptation when telling stories about suddenly reunited parents and their children is a certain degree of biological chauvinism, with the assumption being that the presence of a birth parent is always going to be a good thing, all other things being equal. 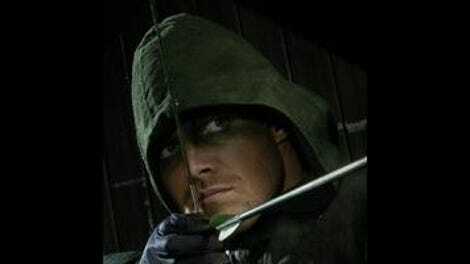 Yes, Oliver’s life as Green Arrow (and as a mayoral candidate, given that’s still supposedly the only reason Darhk is targeting him) presents a real danger to William’s safety, but Diggle argues that it’s worth working through that and figuring out some way for Oliver to be there for his son. Mari, by contrast, argues some parents and the lives they lead are just too dangerous to their children, and if the only way to preserve the child’s innocence is to stay away, then that might well be a sacrifice worth making. Neither of those perspectives is necessarily right or wrong, but it’s a significant show of respect for Mari’s character that the show lets her argument carry the day. So too is it a big deal for her to take such an active role in handing Darhk his most significant defeat yet. The way that Vixen helps out reveals a fascinating truth about the ever-expanding Arrowverse: When Damien Darhk is just an isolated character, unique in his ability to wield magic, there’s no particular reason for his power to be defined as anything other than just sort of generically supernatural. His abilities lie beyond Team Arrow’s experience and comprehension, and that’s all we really need to know. But introducing other heroes from the DC Comics mythos means Darhk’s magic now has to exist in this larger context, and it has to obey some kind of logically consistent rules. With John Constantine busy in Hell—maybe he’s running the place while the usual boss is impersonating Castle in Los Angeles—Mari becomes this universe’s resident expert on magic, and the show actually justifies the opening suggestion that Team Arrow has to fight smarter, not harder. In this case, that means finding the person who has the right kind of smart and the right kind of knowledge to see Darhk as not just a force of (super)nature, but rather someone in possession of some incredible source of power. As it turns out, that source can be found and destroyed, and there’s every possibility Darhk is just another man now. As for the larger story that necessitates Vixen’s guest spot: Well, I’ll say the William story works better here than it did in last week’s misfiring episode. Or, more precisely, all the things that were handled poorly or nonsensically last week were pretty much the same tonight, but they took up way, way less of the episode. Felicity’s decision to walk out on Oliver is more or less justified—I mean, in real life, a person doesn’t require any justification to leave a relationship he or she no longer has trust in, but I mean narratively justified—but the issue here is that Arrow appears desperate to give Felicity a valid reason to walk out while trying hard to preserve Oliver as not a complete jackass. That, I’d guess, is the main reason behind the contrivance of Samantha swearing Oliver to secrecy, as it’s otherwise a plot move so nonsensical Felicity actually calls it out as such tonight! But the good thing is that last week’s iteration of the conflict was primarily something in the abstract and something built around implausible lies. Adding Darhk to the mix tonight solves both those problems quite neatly, as the question of how to handle the William situation is no longer hypothetical, and everyone suddenly has to deal with all those uncomfortable truths. Because this is Arrow we’re talking about, a lot of that is run through the prism of soap opera—I’m not even really complaining, as that’s just the way this show rolls—but there are some moments of surprising emotional reality mixed in there. In particular, Laurel and Lance get a beautifully understated moment where the former admits it’s still a little upsetting to have this sudden, visceral reminder of Oliver’s former infidelity, and Lance immediately acknowledges that as a reasonable thing to be feeling. It’s a cool moment, in part because Arrow generally prefers a steady mix of emotional pyrotechnics and sentimental reflections, and that moment feels so different from the usual pattern. But it’s also just a moment where the show stops treating its characters like chess pieces and just lets them be something like real people for a moment. Laurel and Lance sharing that little interaction serves no greater purpose, but it makes them feel real. Everything to do with Oliver, Felicity, and Samantha has pretty much the exact opposite problem. I won’t complain too much, because this broken setup produced one hell of an episode—a whole lot of credit to Vixen, I suspect—but I do wonder how much success the show is likely to have as it shifts its focus to what’s next for Oliver and Felicity. Do check out the animated Vixen shorts if you haven’t yet. One highlight is the great Neil Flynn as the voice of Mari’s adoptive father. Given his network TV commitments, I can’t imagine Flynn could have much of a role if Vixen ever made a more permanent move to live-action, but I’d sure like to see him play the character at least once. Also, Stephen Amell and Grant Gustin? My goodness, are they not voice actors. Malcolm Merlyn, after flirting with being an uneasy ally, is moving back into full-on arch-villain territory, with an added dose of psychosis and victim-blaming this time around. I believe this is what we nerd TV critics like to call the “Gul Dukat joining the Dominion” of character moves. Or at least, that’s damn well what it should be called. So, seriously, how does Damien Darhk not know that Oliver Queen is Arrow? Did John Constantine put some magical protection on him, or something? Or is this just that one blind spot that even a genius like Darhk just has to have? Because no, it doesn’t feel at all plausible that Darhk would not have worked that out. In a fun little coincidence, given Vixen’s home city, I’m writing this review while on a visit to Detroit. And … we’ve already exceeded how much I imagine any of you care about my private life, so I’ll stop.